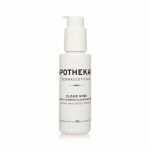 Apothekari Cloud Nine Foaming Cleansing Creme (100 ml/3.3 oz) is a new generation of gentle, foaming cleanser, that not only cleans, but also moisturizes and protects skin. Rich with antioxidant and anti-inflammatory ingredients, Cloud Nine Foaming Cleansing Creme soothes aging and sensitive skin, while delivering a healthy glow to all skin types. This is the cleanser you’ve been waiting for. Cloud Nine Foaming Cleansing Creme is suitable for all skin types, including sensitive skin and individuals with rosacea. May be used post-treatment. Free from artificial preservatives, fragrances and colors. Once or twice daily, prep face by splashing with warm water. Apply a small amount of Cloud Nine to palm of hand. Add water and rub hands together to create a frothy foam and cleanse skin. Rinse well.